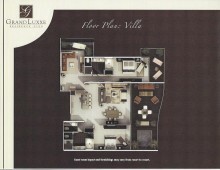 The Grand Luxxe Villa is 3,000 SqFt, and includes 2 master bedrooms, each with its own Jacuzzi tub and dual sinks. The Villa has an additional ½ bath off the living room and a second sitting area with a balcony, which may be used as a 3rd bedroom. The living room includes 2 sleeper sofas, a full kitchen with granite counter tops, blender, microwave, stove top, pots, pans and silverware. The large outdoor living balcony has a private plunge pool, dining table and complete patio furnishings. The Villa will accommodate 8 to 10 people. 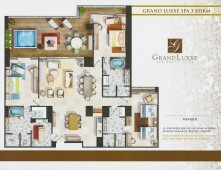 The Grand Luxxe Suite is 2,700 SqFt and includes 2 master bedrooms, each with its own Jacuzzi tub and dual sinks. The Suite has an additional ½ bath off the living room where there are 2 sleeper sofas, a full kitchen with granite counter tops, blender, microwave, stove top, pots, pans and silverware. The large outdoor living balcony has a private plunge pool, dining table and complete patio furnishings. 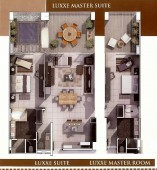 The Suite will accommodate 8 to 10 people. 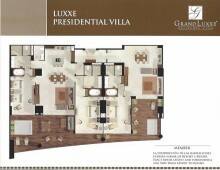 The Grand Luxxe Presidential is 4,200 SqFt and may be reserved as a 1 bedroom, 2 bedroom or 3 bedroom Villa. The Presidential is the ultimate in size and luxury, varying from 1,300 to 4,200 SqFt and sits closest to the ocean of all the buildings on property. Limited availability.